When buying shoes online, you have to know your arch type, pronation style and the different types of running shoes on the market. Lets take a look at each category separately with great techniques that can help you buy the best pair of running shoes without having to leave your home. An easy way to find what your foot type is at home is to take the wet test. The wet test tells you whether you have a flat or high arch, something you must know before buying the perfect running shoe. Once you have your footprint on the paper bag, observe the shape of your foot and compare with the picture below to determine what type of arch you have. Understanding what type of pronation style you have is important when picking out the perfect running shoe. Running shoes are designed for different types of pronation: the body’s reaction to ground impact, causing the foot to roll inward. 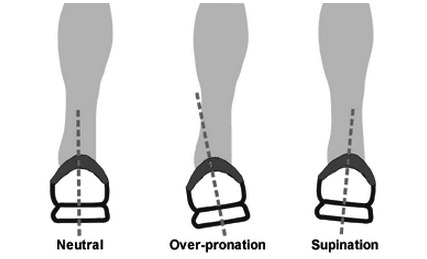 Three types or pronation can occur: neutral pronation, overpronation and supination. The wet test, explained above, can also help you decide what type of pronation style you have. Lets take a better look at what these types of pronation looks like. This movement allows the foot to move from heel to toe laterally, absorbing shock naturally. It is the best way to run, allowing flexibility and reducing chances of pain and injury. Any type of shoe can be worn however specialty shoes for pronation should be avoided. This movement happens when the big toe and second toe primarily push off while running. Overpronation results in an uneven impact throughout the foot and ankle, causing severe pain in the knee, foot and shin. When wrong shoes are put in the mix, pain can worsen and injury can occur. Orthotic shoes are designed to help with overpronation, providing stability and shock absorption where needed. This movement happens when there is little inward rolling of the foot once hitting the ground. When this happens, impact is absorbed by the outside of the foot, placing extra stress on the foot. This type of stress can cause severe injury such as achilles tendinitis and plantar fasciitis. Shoes that are lightweight, have flexible inner sides and have curved lasts are recommended for this type of pronation. Learning what type of pronation you have will help you immensely when choosing the perfect running shoe. If you have neutral pronation, stay away from any type of pronation-speciality shoe. If you have overpronation, aim for orthotic shoes. If you have supination, go for cushioning and flexibility. There are three different types of running shoes: motion control, stability and cushioning. Motion control shoes include stiffer heels and straighter lasts that help counter overpronation. These types of shoes are perfect for moderate or severe overpronation. Stability shoes have a heel counter, supportive upper patterns, contoured footbeds, a straight last and a medial EVA post. This works great with neutral pronation or mild to moderate overpronation. Cushioning shoes provide shock absorption and a minimal arch side support. This shoe type works great for mild pronators, supinators, or neutral pronation trail runners. Now that you have figured out the perfect type of running shoe, it's time to go find it! With eFootwear’s exchange and refund policy, buying shoes is a no brainer. eFootwear provides a full refund or exchange with no restock fee as long as the shoe is returned within 30 days. For more information on eFootwear’s return policy, click here. Now -- go take a look at all of our selections, to find the perfect running shoe that fits your needs!